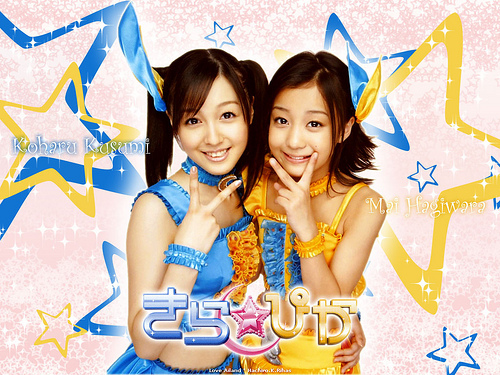 Anyway, this weeks poll winner was the temporary anime duo unit, Kira*Pika, who has one of the most annoying songs in H!P discography! The song, named Hana wo Puu~n spawned 13 votes from everyone, making it the winner for this poll! So, congratulations to Hana wo Puu~n for being so daned annoying! In second place comes Papancake, a song sung by Koharu Kusumi for the very same anime, Kirarin Revolution. This song is known for the incessant annoyingness as well as the repetitive nature it brings. The song brought in 7 votes! In joint 3rd place, we have Koharu Kusumi's Konnichipa and C-ute's Ooki ni ai de Motenashite, both coincidentally also a part of the Kirarin Revolution anime track list, both gained 6 votes each. I agree that both these songs are really annoying and headache inducing. In 4th place, with 4 votes, is Morning Musume's cover song of Pin Pan Pon Taisou. Personally I like the song, but some do find it rather annoying. Then, in 5th place we have Hello Project no Theme by Hello! Project all stars. This gained one vote, however I guess some do find it annoying. I have never heard it, actually. Then, finally, in last place we have a Mini Moni song called Rock n' Roll Kenchoushozaichi, which spawned 0 votes. Go Mini Moni! So, with 25 votes (Thank you so much ;a;) we end this poll for the week. So, what's next? Well, the next poll question, of course! This time I will base the poll on Who Is Your Favourite Hello! Project Group?, because with all the changes, maybe our minds have changed a little. I feel that, though the changes have happened, I still love Morning Musume, if not even more, as well as still love S/mileage. However their singles will show me whether my love is still there, or if it wavers. And I would have done a poll on who you think will graduate next, but really, people only say Reina, Risa, Aika and Sayumi - never a Berryz or C-ute or a S/mileage member. So I'm gonna wait it out until something else happens. No Buono for the new poll? And yea, you can only change a poll if nobody has voted yet with Blogger.